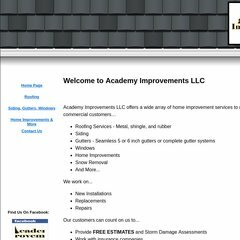 Topics: Roofing, Siding, Gutters, Windows, and Domain Names. It is hosted by Godaddy.com Inc (Arizona, Scottsdale,) using Apache web server. Its local IP address is 208.109.14.129. There are 2 Nameservers, ns09.domaincontrol.com, and ns10.domaincontrol.com. PING (208.109.14.129) 56(84) bytes of data. A time of 60.6 ms, is recorded in a ping test.